The Exerpeutic Inversion Table with Comfort Foam Backrest is a low-priced entry in the inversion table market from Paradigm Health and Wellness. First sold at the end of 2011, this product brings all of the benefits of inversion therapy to consumers on a budget. Currently, this product retails at $102.47. Inversion tables allow the user to hang in an upside-down position, which takes all of the gravity-induced stress off of a user’s spine. The Exerpeutic Table accomplishes this by utilizing a combination of ankle holders and an adjustable tether. This combination allows the user to comfortably achieve multiple inversion angles. Also, heavy-duty handlebars allow the user to return quickly and safely to an upright position from every possible inversion angle. 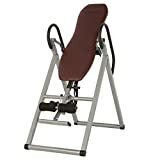 With a sturdy frame that is capable of supporting up to 300 pounds, people of all ages and sizes can enjoy inversion therapy sessions with this product. One of the most important factors in the usefulness and quality of an inversion table is sturdy, solid construction. It’s almost impossible to relax in an inverted position when the user is concerned about their safety and well being! 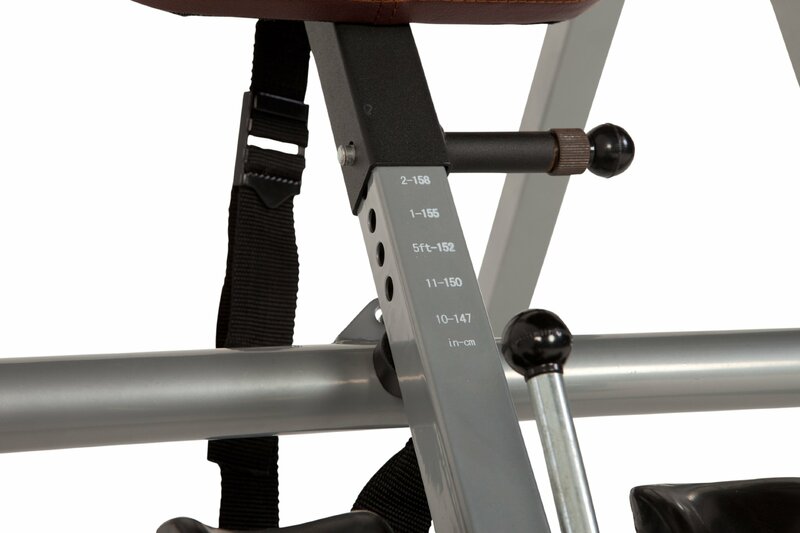 In this area, the Exerpeutic Inversion Table delivers–particularly when considering the low price point. It achieves this feeling of solid stability through a combination of high quality materials and a square base. Often, inexpensive inversion tables utilize a rounded base. This is perfectly fine, but can contribute to a feeling of instability when using the product. Another key benefit that this table offers is its fold-up construction. Inversion tables don’t really fit with the decor of most homes, regardless of their price point. As a result, storing the table when not in use is a priority. This product folds up to such a degree that it is easily stored in a small closet or even underneath a bed. Even if you’re required to store the unit upright against the wall, it is sufficiently small and thin enough to not draw unwanted attention. Since this equipment a lot of moving parts, assembly can be quite a chore. Fortunately, this product comes with a minimum of assembly required and is packaged with simple, easily-managed instructions. As a result, most people report that assembly takes no more than 45 minutes. That said, assembly is much more easily accomplished with two people rather than one. This is due to both the size of the table and the integration of multiple moving parts. Most importantly, this product offers comfort that is rarely seen at such a low price point. The foam backboard is rigid enough to allow for ample support, while the benefit of multiple inversion angles allows for a customized inversion experience. In spite of the rigid support required, the backrest feels surprisingly welcoming–and is well-suited for longer inversion therapy sessions. Balance is a key issue when considering an inversion table. The Exerpeutic Inversion Table offers a well-balanced feel, but only after a great deal of time is spent setting it up. Finding the sweet spot for your inversion sessions can be difficult, and it is likely that you’ll have to readjust this balance as you work with the product. Also, higher priced tables offer lumbar supports for additional comfort. This product only offers a firm, flat backrest. While consumers wouldn’t expect all of the bells and whistles of a higher priced product, this could be an important consideration for people with lower back pain. This can be dealt with through the use of other personal supports–or even a rolled up towel–but chronic pain victims may wish to look into tables with this feature built-in. In all, the Exerpeutic Inversion Table with Comfort Foam Backrest is a high-quality offering at an extremely reasonable price. With construction and comfort to rival inversion tables at much higher price points, it’s a great choice for people looking to combine function with economy. It’s rare to find such a sturdy, well-constructed product in this range. No matter what your size, condition, or experience with inversion therapy is, you’ll be pleased when you choose this table.